Despite the chaos that currently surrounds us on Brexit, here at Cube we’re business as usual and in fact we’ve delivered fantastic business results for the start of 2019! 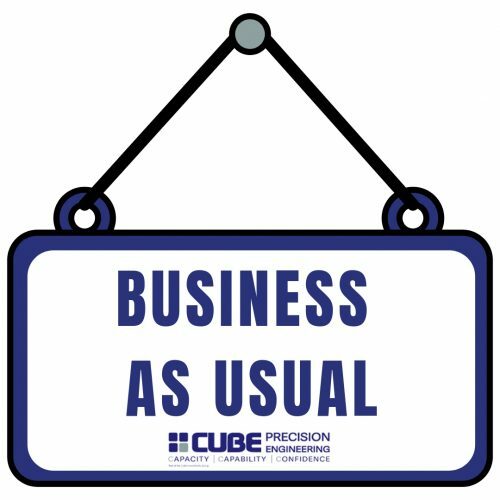 Business as usual is very much our motto here at Cube, despite the uncertainty that we are facing regarding Brexit and whether we will in fact leave with ‘no deal’ in just two weeks. That’s not to say that Brexit hasn’t affected us at all, last Autumn, Q4 did feel in our industry that there was a slow down and we believe that the government’s stance on DERV and Brexit played a part in this. However, our first quarter of 2019 has been very much a different story. In just the first two months (Jan and Feb) our revenue was up 300% on where it was the same time in 2018, with 78% of sales coming from our existing customers. In terms of our Automotive business we have seen some exciting projects come through with the opportunity to work with niche sports car manufacturers on projects that will produce fewer than 50 vehicles. We’ll be making the A class panels for the roof, front and rear fenders. Aerospace has also continued to be positive, with New Engine Options (NEO) coming through on which programmes we will be heavily involved in the design and development of new tooling. Why not take a look at the different types of industries that we work in and the tooling and fixtures that provide. Whatever may be around the corner we’re continuing to focus on delivering exceptional customer service and looking for opportunities for new business growth. A strategy that is definitely working for us in 2019! If you’d like to be part of a thriving engineering team then make sure you keep up to date with our job opportunities, posted in our news section and follow us on LinkedIn.